2014 Chevrolet Camaro Saleen S620 Yellow Label For Sale in Hampstead, New Hampshire 03841 Get ready for the ultimate driving experience with this 2014 Chevy Camaro Saleen S620 Yellow Label! This two-door coupe features a crisp, muscular styling that is sure to capture the attention of anyone who sees it. With stunning white paint complemented by an exceptionally clean black leather interior, this bad-to-the-bone Camaro is sure to turn heads. However, don't let this Camaro's dashing good looks fool you. This handsome devil is much more than meets the eye, and the faint of heart need not apply! Powered by a supercharged, 6.2-liter V-8 engine that is mated with 6-speed manual transmission, this car has been enhanced with the intelligent formula for which Saleen manufactured vehicles are known and pumps out an impressive 625 horsepower. With only 16,500 miles you can rest assured that this S620 Yellow Label will hand you all the power you could possibly ask for to feed your need for speed! Since 1983 Saleen has been putting 'Power in The Hands Of a Few' and this S620 Yellow Label is no exception. During manufacturing, each vehicle is cataloged and serialized with its own unique Saleen VIN, a process that lends itself to the collectability and high resale values that Saleen vehicles have been known for over the past 30 years. Handling is maintained by the Saleen S4 bushings, links and specific-rate suspension springs. Ground control is managed by the Saleen styled 20-inch wheels and Z rated tires. The design concept is comprised of an aerodynamic rear valance redesign. This incorporates a S620 specific package consisting of a high downforce rear spoiler atop a Saleen decklid insert. Additional aesthetic details include model specific interior and exterior badging which reinforces the amazing lineage that makes up this Saleen vehicle. Other specifications include a sunroof, heated leather seats, navigation system, anti-theft alarm, keyless entry, heads up display and a backup camera. Additionally it has all the power options such as windows, seats, steering, locks, A/C climate control, and cruise control. It has even been verified through Saleen to be 1 of 1 with its color and options! 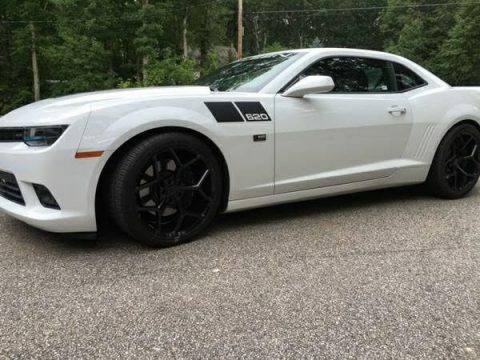 Top it all off with the original Saleen wheels and this unparalleled Camaro is a dream come true for anyone who craves the ideal combination of performance and curb appeal. This 2014 Chevrolet Camaro Saleen S620 Yellow Label Coupe has been meticulously maintained. It has never been smoked in and always garage kept. This Camaro is number 11 of the S620 Yellow Label Series and truly one of a kind. It is a must see/drive to appreciate its overall package. In fact, come see for yourself! You will agree that you cannot find another '14 Camaro Saleen S620 Yellow Label in this condition for the asking price. Don't miss out on this amazing opportunity - Call today for more information on how you can get behind the wheel of this performance oriented powerhouse!! !